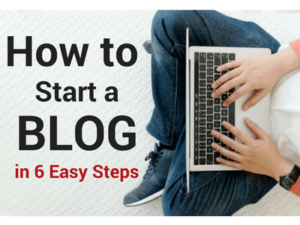 You can read all the personal finance blogs and books ever produced to learn to be successful with finances. However, none of it really means anything until you use that knowledge to take action in your financial situation. To set yourself up for financial success, you have to focus your effort on things that work, and stop wasting precious time on those that don’t. Below, you'll find some of my best financial success tips you can use immediately! Today I’ll help you take action by giving you 21 action items that will help set your finances up for massive success. All you have to do is set aside a few minutes to implement just one of these tactics at a time. Once you complete one, then move on to another. The more of these you complete, the more success you’ll have in your finances. If you’ve already completed some of these action items, that’s great, you’re ahead of the game! Complete the rest of these steps and you’ll succeed that much more! Credit cards are not your friend. You spend more money when you use credit cards. Carrying a balance (like the majority of card holders do) incurs interest and fees that increase your cost of living. The convenience of using credit cards is not worth the dollars wasted. Go naked and stop using credit for good. Pay yourself first, before you pay credit card companies and car payments. Put a designated amount of money into savings and investments before paying anyone else. Waiting to put money into savings and investments with what's left after paying the bills rarely works well. Have money automatically deducted from your paycheck and put into a 401k, IRA, or other investment account. If you invest automatically, you won’t even have to think about it when you get paid, it's already done for you. When you pay yourself first, retirement accounts are where much of that money should go. You can contribute to an IRA, Roth IRA, 401k, 403b, or whatever plan may be available to you. Your first priority should be to contribute to accounts where your employer matches your contributions. Manage your retirement accounts (+all your other investments) in one place! Personal Capital has the powerful tools you need to make it happen. Learn how Personal Capital works here. Once you ditch the credit cards, use only cash to finance your life. Cash also includes checks and debit cards. When you use cash, you know you have a limited supply of money so you're more thoughtful about your spending. I prefer to use cash in an envelope system. You can make the transition to cash only in 3 simple steps! Invest in knowledge and skills that make you more valuable to your employer or your own business. Mastering new technologies and skills almost always translates into more money through raises, job promotions, or increased business. Your finances will thank you! Spending less than you make sounds obvious, but most people don’t do it. Living on less than you make is not hard to do when you go cash only and consistently do a written monthly budget. Most people who are in debt are spending more than they make every single year. Much like the federal government's finances, this is unsustainable in the long run. Stop making excuses and just do it! I’ve been preaching this for years and I won’t stop. Do a written budget every month, spending your money on paper before you spend it in the real world. 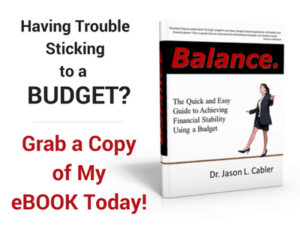 A written budget for your finances absolutely the best tool you can use to get complete control over your finances, spend less than you make, and stop living paycheck to paycheck. I wrote THE book on how to make a budget that works. You can check it out here. If you work for someone else, make sure to become so valuable that you can’t be ignored. The more value you bring to your employer on a daily basis, the more likely you are to get raises, promotions, and other recognition. Most employees are just there for the paycheck, and they prove it by doing average work. Making the effort to be above average always pays off. Debt is a drag on your finances and your life. When you use it, you always pay more than if you had just used cash instead. 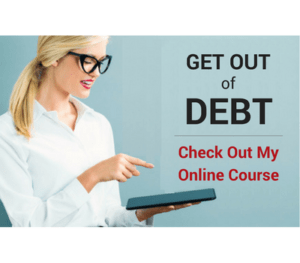 Make a plan to get out of debt, work that plan to completion, and you’ll be shocked at how freeing it can be to live without debt payments dragging down your finances. Having a positive attitude is a choice. Recognize when you’re acting or talking in a negative way, and learn to counteract those negative words and actions with positive self talk and actions. Relentlessly positive people get more done and bounce back from failures much quicker than negative people. I don’t mean this in a shallow way, as in making friends just to get something out of someone. Hang with people who share your values and are positive, successful people. When you hang out with these people you’re more likely to emulate them and learn from them. Keep the negative Nellies at arms length. Just like your momma said, you are who you hang out with. You can’t truly be a financial success unless you give some of your money away. The more you have, the more generous you should be. I recommend at least tithing 10%, as well as giving additional amounts on top of that. The Bible says repeatedly that when you’re a giver you will have at least what you need. In addition, you will even have an abundance, which allows you to be even more generous. Giving is a virtuous cycle that benefits everyone involved. Giving is good for your finances! You WILL have an emergency that requires money to fix! When you are prepared for the inevitable car breakdown or water heater explosion, you’ll have the finances to deal with the problem on the spot. If not, you'll have to deal with payments and interest for months or years because you weren’t prepared and had to go into debt. You can read more about how to start an emergency fund here. Over the long term, owning a home is better than renting in most cases. It doesn’t always have a high return as an investment, but owning a home does build long term wealth as you build up equity over time. As you get the home paid off, you won’t have the problem of paying ever increasing rent in your old age as your income declines. Studies have shown that a happy marriage can be key to building financial wealth, as well as a healthy, happy life. Work on your marriage consistently to continue making the relationship stronger over time. An unhappy marriage or a divorce has huge costs to emotional happiness and finances too. Here are a few posts on money and marriage you might find helpful. Eat right, exercise, get rid of stress, and maintain balance in your life. When you pay attention to your physical and mental health, you’re happier, have more energy, and are more productive. Taking care of your body and mind through healthy habits allows for a longer, higher quality life, and allows you to be more able to care for the needs of yourself and others that depend on you. Make sure you have health insurance, life insurance, home insurance, disability, and any other insurance that will protect you and your family and finances against an unforeseen disaster that can ruin you. These things happen more often than you realize, so be prepared. Yes, you can pay cash for your next car. I’ve done it three times now, and it feels so great to not have car payments any more! Here’s how you can pay cash for your cars until you die or the kids take away the keys. We weren’t put on this earth to live only for ourselves. Connect with God through a robust prayer life, studying His word, service to others, and fellowshiping with other believers. You can’t be truly rich without God in your life. 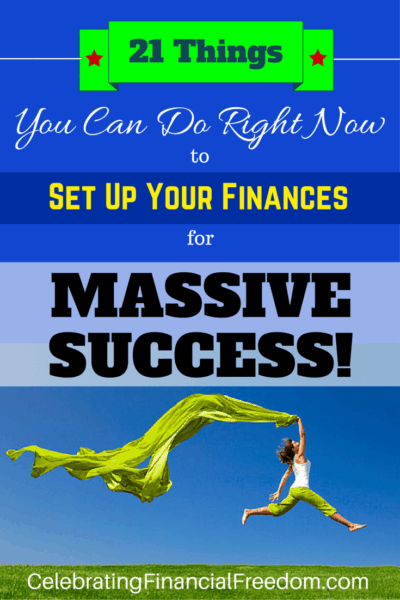 When it comes down to it, setting up your finances for massive success is not just about money. It’s about achieving bigger and better things in every area of your life, and not letting yourself be exposed to unnecessary problems that can be prevented by being diligent. The key to all of these is action and consistency. When you actively integrate these things into your life and turn them into habits, that’s when you’ll get the maximum benefits from them. You certainly shouldn’t attempt to do all these at once or you will be overwhelmed. Pick one or two at a time to work on, and proceed from there. Question: What are the first one or two things you want to work on? Did I leave anything out? These are all great points. I think pushing yourself to try the cash method is a great tool. Its way to easy to watch money just disappear in our digital world. By actually using cash you become aware of when and how you spend, and you pay much less than with credit in the long run. Thanks for the post! You’re absolutely right! I’m a huge believer in going cash only. If more people would try it, I really believe most people would prefer it because it keeps your spending under complete control, and you don’t spend more for every transaction, which increases your cost of living.